who may be wondering where to even start. when she posted pictures from her gorgeous november wedding. a former memphian now living in washington, d.c.
Like most girls, I had a vision for my wedding day (and dress) long before I got engaged. While certain aspects of my vision changed, the overall feel remained the same. I wanted to look traditional and timeless. I had always envisioned wearing a lace dress with some sort of sleeve. I felt these two things brought a classic element to a wedding gown. My wedding dress experience was rather untraditional in the fact that I had decided on a dress long before I was engaged! 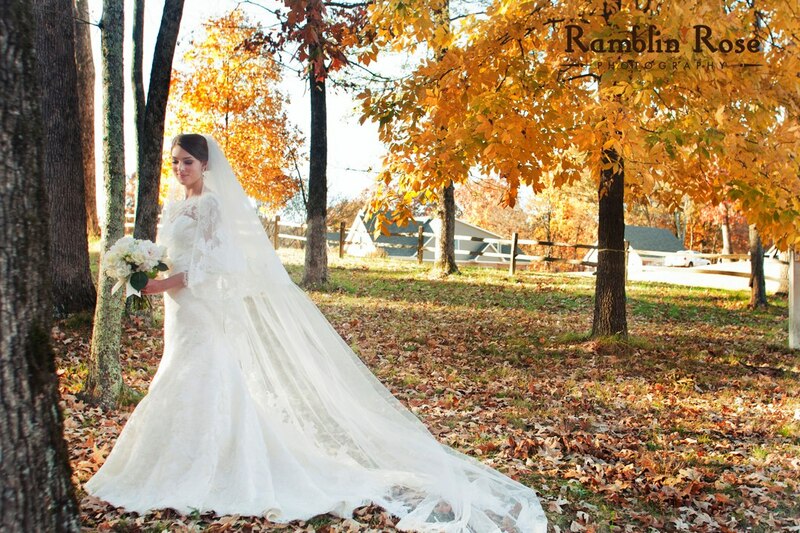 Like most girls, I would peruse wedding dresses on the Internet for fun, just to see what was out there. One day I just happened to stumble across the “Kennedy” dress by Modern Trousseau. The moment I saw it I just knew that would be my dress. Shortly after I became engaged, I made an appointment with a bridal boutique in Georgetown that carried the designer’s gowns. I would describe my dress as traditional and classic, with a little bit of drama. This is also the basis for my personal style. I like to wear things that will stand the test of time and resist looking dated. I felt that this dress definitely had that component to it. It was made of beautiful French Alencon lace in a diamond white color. 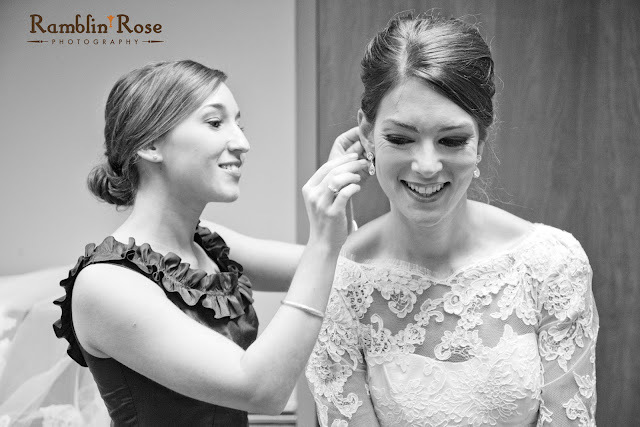 It had a bateau neckline, full lace sleeves, and a fit and flare silhouette. The drama aspect of the dress came from the plunging open back. But it still held true to its traditional elements by having a row of tiny buttons down the center back. I loved everything about this dress! I wanted to wear as much lace as possible! 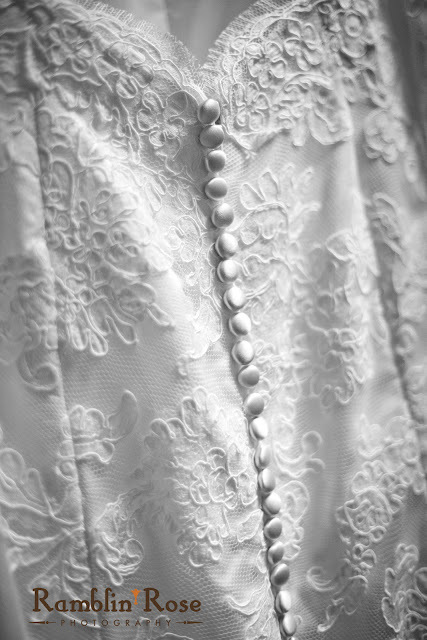 I love the delicate and feminine quality it adds to a wedding gown (or any article of clothing for that matter). My personal inspiration was my Mom. Her dress was very similar to mine in that it had long lace sleeves, and a high neckline. It was a beautiful dress that has stood the test of time. I wanted to have a similar feel for my wedding dress. It’s so hard to pick just one thing! I loved everything about my dress! One thing that I think made it stand out from other lace dresses was the neckline, in both the front and the back. It had an understated sexiness to it that complimented my personal style perfectly! There were no drawbacks to my dress; it truly was perfect for me! As I mentioned earlier, I went to the bridal boutique specifically for this dress. Trying it on only confirmed what I already knew, this was my dress. I did try on other dresses after that one, but only because my mother wanted to see her little girl in the classic “princess ball gown”. All the dresses were beautiful, but nothing compared to my dress! My mother was the only one with me the day I bought my dress. I had originally wanted both my mother and my father, but my father was out of town on business the day we went. She of course teared up the moment she saw me in the dress. But what was really special was my dad’s reaction over the phone. I knew I would not be able to by a dress without his approval, so we got special permission from the designer (who was there helping me get into the dress!) to take a picture and send it to him. The moment I got on the phone he immediately choked up and told me how beautiful I was and that there was no other dress for his little girl. It was a very special moment. My husband, Tom, loved the dress! My photographer got a great picture of his face as he saw me for the first time (which was as I was walking down the aisle). He was teary eyed, smiling ear to ear. I loved my bridesmaids’ dresses! They were by a Charleston based designer named Lula Kate. They were navy silk shantung cocktail dresses that each girl could customize to best suit their style and body type. I wanted my girls to feel comfortable and beautiful. One of the great things about Lula Kate was the ability to mix and match. For example, my girls could pick what they wanted the top of the dress to look like (one shoulder, ruffle, sleeves, strapless, etc) and pair it with the skirt they liked best (straight, A-line, tulip, full, etc). I was so grateful and blessed to have these girls stand by me on the day of the wedding. The last thing I wanted to do was make them pay for a dress they hated. As I mentioned above, I wanted my girls to feel beautiful and love the dress they were in! Therefore, choosing a designer who gave my girls the freedom to customize their dresses was a no brainer for me. I chose navy because it is one of my all time favorite colors to wear. It’s not as harsh as black, yet it is equally as chic and timeless. The silk shantung fabric held the color beautifully. It provided a depth to the color that would have probably been lost on a less structured fabric. The advice I wish someone had told me has less to do with finding a dress and more to do with accessories. I wish someone had told me how long it takes to get a veil! I ordered my veil at the beginning of August and the bridal consultants told me that it wouldn’t get in until the week of my November 10th wedding! This was a huge problem considering I was ordering the veil in a different color than the one I had tried on. I wanted to ensure the color of the lace on the veil matched the lace on the dress. 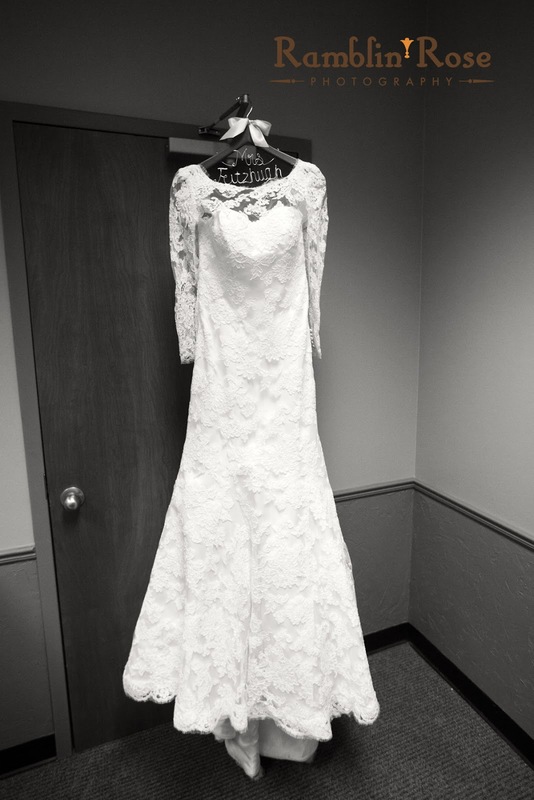 Fortunately it came in at the end of October and I was able to take it with me to my final fitting! My wedding day accessories were very limited. I really wanted my dress to stand out and not be overpowered by extra sparkle or shine. 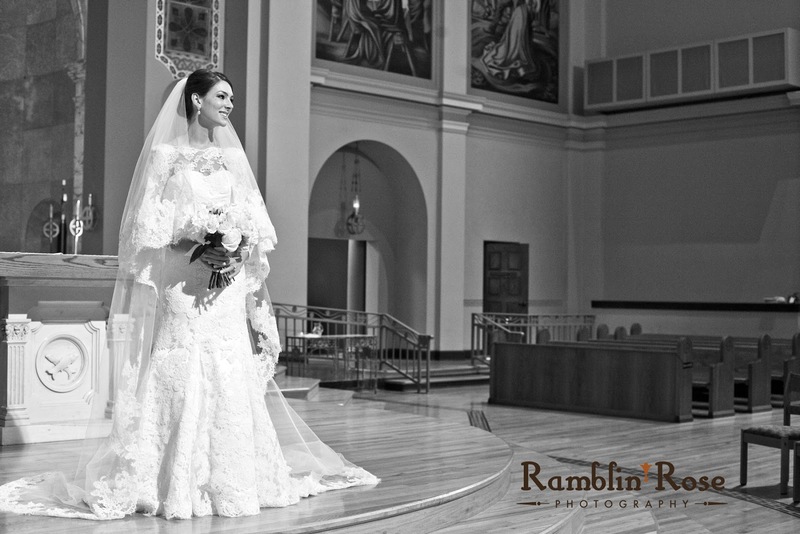 My accessories were limited to a veil, simple diamond teardrop earrings, and traditional white satin peep toe shoes. 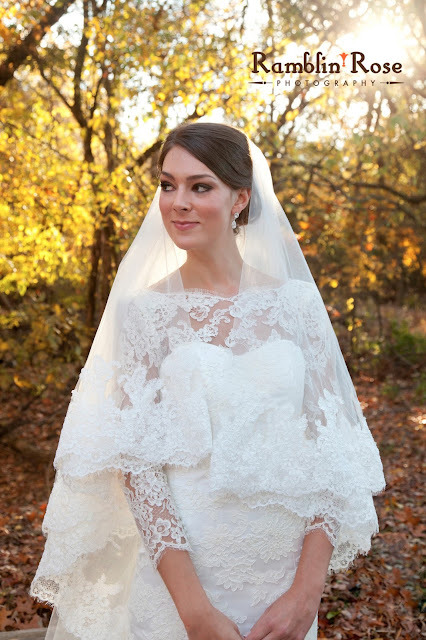 My favorite accessory was definitely my veil. I wore a two-tier cathedral length veil that was fully trimmed in 6-inch thick Alencon lace. The second tier was used as a blusher as I walked down the aisle. 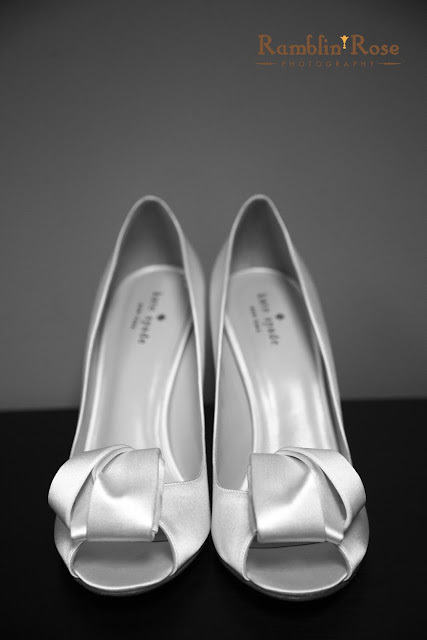 My shoes were much like my dress in that they were very traditional in the front, with a bit of drama in the back. They were by Kate Spade and had a fun gold glitter heel! Like any girl, I love to experiment with fun accessories, but my personal philosophy when it comes to accessories is less is more. As much fun as it is to wear colored shoes and sparkly baubles, I didn’t want these things to take away from the dress. I wanted to remain traditional and classic. So I looked for accessories that complimented this overall look.